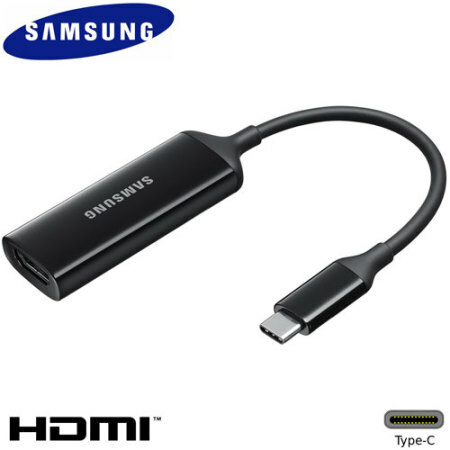 Connect your Samsung Galaxy S8 to your HDMI television or monitor with the official Samsung HDMI Adapter. Enjoy videos, photos and even games all on the big screen. Bought this for my S8 to connect to my TV. Works just fine, easy to use - just plug the HDMI in and you're off! The fact that a wireless charger or other means of charging is required while watching a long hd movie. Otherwise the phone's battery will be almost flat when the movie finishes. My previous MHL adapter from mobile fun used with my note 4 had a charger to keep the keep the phone charged while using. The new HDMI adapter requires the purchase of a wireless charger. Had I known this before purchase I would have purchased the samsung DEX. It works as advertised (I have Galaxy S8+) at 3840x2160p60 but you cannot charge the phone whilst using it, but only buy it if you absolutely need HDMI for a television or something. Otherwise find a superior DisplayPort adapter, preferably with a USB PD charging port to allow charging through the adapter. The main reason I purchased this adapter is because it is made by Samsung and designed especially for the Galaxy S8 - you know it will work. But that does not mean that better featured adapters are not out there. They are just harder to identify. This adapter should work with other devices but I do not have any other devices to test it with.